Read the article at Rolling Stone. Of the now-legendary performances at the Monterey International Pop Music Festival in 1967, perhaps none carried the social weight of Otis Redding’s. In a sharply segregated music landscape, the young soul singer had been a staple on R&B charts since 1963. 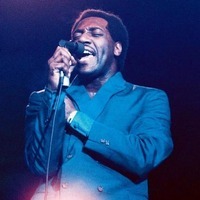 But backed by Stax Records’ house band Booker T. and the M.G.’s, Redding’s searing Saturday night headlining set marked the first time he’d played to an overwhelmingly white audience – one that, it turned out, couldn’t get enough of him. Redding died less than six months later, at the age of 26. Does being at this site bring up memories of the first one? You know, everyone wants to know what I thought of the [original 1967 festival], but I can’t tell you, because I was just talking to [Cream bassist] Jack Bruce the whole time. I missed the entire concert; so did he. But obviously there was a large social implication to this event – musicians meeting that didn’t normally hang out together. For us in particular it was very new. Some of the hippie musicians knew each other, but we didn’t. We were the only ones in suits, we had on mohair suits and ties. And of course the year 1967 was a pivotal year for African Americans and for African-American music. There was trepidation. Otis was anxious, he didn’t know what to expect, and then we had a very warm welcome. They accepted him, even though their parents might not have accepted him. The social implications of that were huge. Between the Civil Rights movement and the anti-war movement, the political moment in which the ‘67 festival took place is such a big part of this story. Do you see echoes of that climate in the U.S. today? You used the word echoes, and you couldn’t have used a more accurate word. It’s an unfortunate word in this case, but it is an ongoing battle. Music is such a big part of it. We were young and naive, and we heard all the songs from Hair – you know, the “coming of the age of Aquarius” – all those songs that predicted a spiritual, metaphysical type of change for the world. And we thought, well, oh my God, this is it, we’re here in Monterey and this is proof. Physical corroboration that the Age of Aquarius really will come to earth. People have long hair, there’s free food in the restaurants. The police presence was subdued. It coincided with the Civil Rights movement in a lot of respects. It was a momentous time. Looking back at the social progress of that era, did you think we’d be farther along by now? Well, I’m 50 years older now than I was then, and I think I’m a little bit wiser in one way: I look at the bigger picture more realistically now than I did as a 22-year-old, and I think that the human race moves in small increments. That might have been a first step toward the improvement we’re looking for. And I feel hopeful still, but I also have more patience, and I think the type of change that we’re trying to affect is not something that can happen quickly. I have a different perspective. I think we should hold on to our belief in the good of the human race, and our hope that change will actually materialize. But I also think we’re always going to make some mistakes first. Speaking of change: you performed for President Obama a few times during his second term. What was that like? It was great. Just to be at the White House – the tradition there is strong. It’s in the walls. And the president was such a well-read, learned, gracious person; the First Lady as well. We got a very warm reception, the president came down from his personal quarters and hung around the rehearsal a little bit and enjoyed the music. Having that music in that building was something whose time had come. It was soul music, it was blues music, it was the music of the people who built the White House. So that was fitting. You mentioned you’re writing a book – that’s an autobiography? Yes, that’s unfolding. And the more I write, the more I’m thinking about whether or not I have anything to say. But I was just at a high school, talking to students about this – how with all that has happened, I’m still in the same place as I was as a 16- or 17-year-old who was just excited about making music. I think of musicians as a brotherhood with a purpose, and our purpose is being realized right now, so if I have anything to say it’s about that: what music means to people, what we can give people with our work, whether they use it for pleasure or for spiritual events, weddings, or just living day-to-day. It’s about connecting to each other, understanding each other. I think you’re not ever completely alone out here if you’re connecting through music or art.